Do you believe in luck? Have you ever owned an item you consider lucky, such as a piece of clothing or perhaps a coin? Money in general has been considered a source of luck for hundreds of years, such as the lucky penny or the action of throwing money into a fountain to bring fortune. Now let me tell you about a very special ‘lucky’ coin. The Lucky Angel Coin is one of the most impressive and desirable of all European gold coins, not only due to its beautiful design, but because it is thought to bring such great luck. 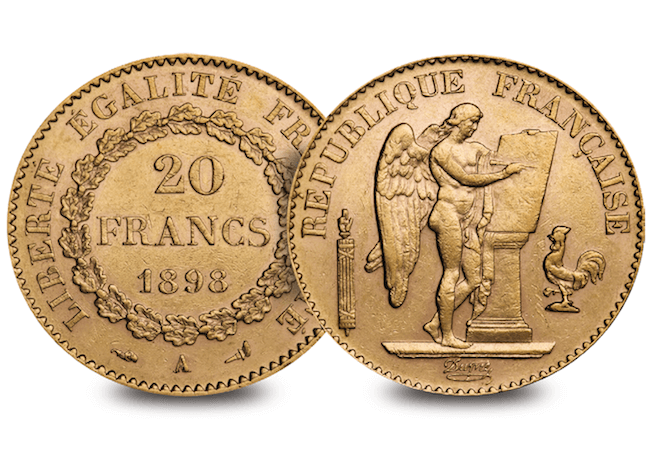 The angel depicted on the obverse represents the Spirit of France and is shown writing the French Constitution. A rooster appears next to the angel as a symbol of vigilance. Behind the angel stands the fasces – previously carried by Roman magistrates as a representation of power. On top of this is the Cap of Liberty. Legend has it that an earlier version of this coin accompanied Napoleon in his rise to power in France and on each heroic campaign, until he arrogantly flung his coin into the river… on the eve of the Battle of Waterloo, in which he was defeated and ended his rule as the French Emperor! This coin was then re-created during the French Revolution and Augustin Dupré was commissioned by King Louis XVI to design it. He was a firm believer in the power of guardian angels and incorporated this theme into his design. Years later he fell out of favour with the king and was condemned to death. Dupré claimed that the Angel coin saved him from the guillotine because he had it in his pocket. He said a quick prayer as he knelt beneath the deadly blade and rubbed his coin for good luck. Suddenly a bolt of lightning struck nearby, causing a panic and halting his execution! Before it could be rescheduled, Dupré was granted a pardon, his life saved. From that moment on it became known as the ‘Angel Coin’ and many stories were told of the wonders of the coin. Fishermen never went to sea without it, WWI French pilots never flew without it. Even pilots from Britain and the United States carried the French coins into battle with them. US pilots continued to put their faith in the coin’s protective powers during the Korean and Vietnam Wars. In fact, the legend of these coins carried such weight that Hermann Goering, the engineer of Hitler’s evil vision, ordered his soldiers to round them up and had them buried in a location that has never been discovered. To this day, many pilots, rescue and police heroes proclaim the Angel’s power of luck and protection. Some blame the coin’s remarkable good fortune on coincidence, others luck, and others a reward for faith. Who knows what these coins actually do, but their legend in itself is enough to want to own one!